My husband and I really enjoyed the initial seminar! We found it very informative and definitely worth attending. The visit with Attorney Kennedy was equally great & couldn’t have been better. All calls were promptly answered & final visit with Amber was all clearly explained & reviewed & finalized! Everyone in this office is friendly and helpful. Justin made sure I understood every step of the process. Amber is very clear in defining the process and what I was signing. We’re extremely pleased with our decision to use this law office. The lawyers and staff were great to work with and extremely patient with all of our questions. They helped us tailor our living trust to exactly meet our needs. Extremely pleasant and knowledgeable firm. They really take the time to work with you and explain everything in great detail. Very much appreciated. I now feel rest assured all my financial and health needs are in order. Super Easy Process for Setting Up Trusts! Awesome people! Extremely knowledgeable and always available to answer questions. Easy process! Everything was explained to us in easy terms. Very professional and friend staff. I highly recommend Litherland, Kennedy & Associates, APC, Attorneys at Law. We found attending their seminar to be very helpful and we would recommend their services to family and friends. Professional service, well organized and excellent communication! Very knowledgeable and answered all questions! Our five star rating results from a combination of prompt, friendly meetings, quick and clear answers to our questions, clear information about the Trust process and our confidence in the firm. Litherland, Kennedy & Associates, APC, Attorneys at Law provided us with a very professional estate planning experience. All questions were clearly answered and explained until we were satisfied. Their scheduling and timing was accurate. We were very satisfied with their service. I’m very satisfied with the service this office has provided me, and I like the fact that they have made themselves available any time that I may have questions or need assistance with my trust and/or estate. The presentation, the follow up trust creation appointment and the signing off experience were smooth and easy. The office was professional & efficient, but not “stuffy.” They made a challenging endeavor much easier to complete than I imagined. I would have done this sooner if I had known how helpful the people in this office would be. Comprehensive, Competent and Stress Free – Everything was professional and easy to complete. Highly Recommend! Comprehensive approach to trust creation and execution – bar is set high! Plan anticipates many future scenarios without needing revisions. Clear explanations and guidance. Friendly, capable lawyers and support staff. Office only does trust creation and administration = high level of expertise and service. Organized and efficient. Employees were very helpful in walking me through the Trust process, explaining each aspect thoroughly, and answering any questions I had along the way. Great team! Justin and the Litherland Team did an excellent job walking us through the trust process and preparing the appropriate documents. I also found their fees to be very reasonable for their services. Informative seminar that precluded the free consultation appointment; highly competent and courteous attorney who explained a living trust specifically tailored to my needs; and articulate staff member who reviewed all pages and portions of my trust. Thank you so much! Very informative, thorough, organized, simplified and friendly. Great Client Services. Modern and up to date. Overall positive experience. We started with attending a Living Trust seminar. It was an excellent presentation. We then signed up for the law firm to create our Trust. It is so comprehensive with excellent support from all staff. The relief and security we feel is priceless. We found the people friendly, efficient and helpful. They put the client first and make you comfortable with the process. We really appreciated Dedra meeting with us and providing such a clear insight into Medi-Cal for my dad. A lot to think about! We are beginning to process it all, as well as look into Medi-Cal facilities for dad. You and your information are priceless! I am extremely pleased with every step of the process, including the 1st seminar to the final closing. They were very accommodating to my changes and answering my questions. Very professional, clear, straight-forward from the initial meeting to the final meeting to review our Trust. We highly recommend this firm for Trust planning. I want to thank you so much on behalf of our family in helping us to secure Medi-Cal for our mother. It has been a pleasure to work with Dedra! All aspects of our plan were well presented and explained when there were questions. Every experience at the law office was exceptional and thorough from first trust seminars to signing of the documents. A pleasing experience. Very relaxed atmosphere. Everyone we talked to was friendly, patient and energetic. The process and choices of trust were explained in easy to understand language, clear and concise. Loved Matt’s use of the white board for visual understanding. Jill was a pleasure to talk with. Hallelujah! Great job!!! Thanks so much for getting everything straightened out with Medi-Cal. You’re worth your weight in gold! Informative and understandable. Impressive customer service. Easy access. Really appreciate the ability to email questions – always received thorough and quick response. Everyone in the office has been very helpful. The Litherland, Kennedy & Associates, APC, Attorneys at Law is extremely professional, very informative, caring and knowledgeable. What a great experience! Feels great knowing my loved one is going to be all right now. Excellent listening, clear that they are accessible and “here to help.” Communicated easily with them by email, phone, and in person. Especially appreciated the clarity of explanations and choice of options. Client seminars are very helpful. Just completed 4th revision of trust – fully satisfied. Very impressed with initial seminar with Roy, his thoroughness and experience is what we were looking for. Very complete, explained well all documents at final signing. Would recommend to friends. Very well thought-out professional system covering all foreseeable events relating to our estate. We are very pleased with the detailed guidance. All the staff members have been of the highest professional level, especially Roy and Justin. Jodi’s smiling welcome and good cup of coffee completed the picture. Our experience with the Law Office of Roy Litherland was very professional and efficient. They explained all the details regarding our living trust and answered all our questions. I would highly recommend their services to anyone looking to establish a living trust. It’s obvious to me that Roy has refined the process of estate planning over many years. His seminar was extremely helpful in highlighting the issues, why it’s so important, and how to optimize the tax advantages. We have used Roy Litherland’s services twice, and received very clear explanations and recommendations. All options were covered, and the process was painless – would highly recommend. Extremely helpful and informative. Process was very smooth and stress free. The seminar was excellent. Follow-up appointments with Roy and Justin were clear and complete. The whole experience was very professional. Our experience with Roy and Justin has been such a blessing from the very first moment stepping into the office. The clarity of professional, pertinent information presented in such a caring manner truly answered all our questions and needs. Our hearts are happy and secure thanks to both of them. 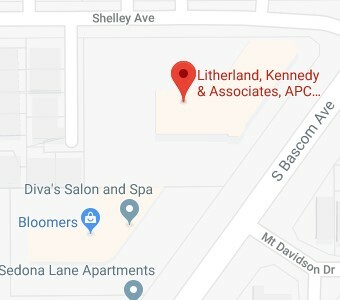 The Litherland, Kennedy & Associates, APC, Attorneys at Law made what is a daunting, cumbersome and rather unpleasant process and made us feel very comfortable and easy. They patiently, efficiently, and proactively guided us through the whole process. Justin has been really stellar in working with our busy schedules to make sure we get through the process thoroughly yet expediently. We really appreciated the patience of Jodi in scheduling our follow up. Thank you! Very informative seminar. Clear, concise information. We are very happy we chose Roy Litherland to handle our estate planning. We were thrilled with several suggestions given to us (upon our request) to resolve certain issues. We were also very pleased with the process and follow-up discussion to answer all our questions about our new Trust!! We were able to walk in and sign without any questions the following day. We’re very pleased with the entire process and look forward to working with the law office for many years to come. They informed us of many areas we hadn’t considered. Outstanding seminars and ongoing, informative newsletters. Roy and Justin were very careful and thorough in creating a trust document that expressed my wishes. I had some unique circumstances and they accommodated them perfectly. I truly would highly recommend them – you will not be disappointed. Roy Litherland, Lois Tager, Justin Kennedy and all the associates at the law firm provided excellent care and services. The best words that come to mind to describe them are “productive listeners” – they really listen and hear all that you are saying. We have had personal experience with the reality of a trust being played out and they provide excellent follow through. Thank you so much. Very satisfied – process was organized, efficient and easy. Excellent service. Attended seminar and met with Mr. Litherland and Mr. Kennedy. Both [are] very knowledgeable, pleasant, thorough, answered all questions. I feel very well taken care of – very good experience. All our needs were met and more. Everyone in the office has been wonderful and helpful. Excellent, easy to understand and complete the process. The free seminar gave exceptional information on living trusts and wills. It was time well spent and I even got a reduction on the trust fee for attending. I would recommend this to anyone concerned about final wishes. Awesome, easy, friendly, knowledgeable, funny. I’ve had many questions when dealing with my dad’s passing and trust. Roy, Susie and all were so helpful and welcoming. I never feel I have to hesitate before asking questions or for help. So easy dealing with my dad’s trust that I have created my own with them. We are pleased with the entire process starting with the educational seminar, then our 1 on 1 with Roy, follow up via phone calls and emails by the staff and the signing appointment. We are confident that our trust has been created by experts and are happy to have this document now fully executed to protect us and our heirs. Everything from the first seminar to the signing of documents was a great learning experience. We feel informed and comfortable having taken this step. The free seminar was useful in orienting the thought and the initial strategy. Two sessions with Roy explored and explained some options of planning and how the trust is structured. The final document is very well organized. Justin clarified all the questions. The action items ensure that proper steps should be taken. Complete client service provided from Medi-Cal application and nursing home advocate to wills and estate planning. “One stop” for expertise and customer support and education and guidance in end of life planning. I recommend this law firm to my family and friends. All aspects of our Estate Plan were clearly and patiently explained, all questions answered. We highly recommend the service of the Litherland attorney office. Very satisfied with detail and professionalism of entire process. Thank you very much. Very positive – made the who process painless. Both attorneys, Roy and Justin, are very thorough, answered every question that we had clearly and precisely. We would recommend their service to anyone. Very informative – from our first phone call to receiving our trust, everyone was very professional and answered all of our questions. Explained everything so we were able to understand, made process very easy. We first attended one of Roy’s Living Trust Seminars and realized we needed to initiate our trust. The process has been client-friendly; all of our questions have been answered and there was little work on our part. Roy, Justin, and the entire staff made us feel at ease and confident in our decisions. Excellent, professional service. Great experience with both Roy and Justin. Glad we attended the seminar which made us come here in the first place. Most important – you are not rushed and you are in control of your decisions. End-to-end a great experience: From the seminar presentation to the signing of the documents. Everything explained thoroughly in an organized way. We recommend this firm highly for all estate planning. What we really liked about this law office is they took the time to answer every picky question we had. They did not try to rush us as we read through everything. Everyone was very friendly to us. Roy’s seminar was very thorough and informative. He is an excellent speaker and encourages questions. When I called or emailed his office with questions, I was immediately assisted. My meeting with Justin to sign documents went quickly and smoothly. There is a lot for the client to take in, but they make the process painless. Very professional, courteous, efficient at all times at a reasonable rate. I am very satisfied and happy. Thank you. Our experience began at Roy’s very informative seminar. We were convinced we made the right decision by selecting Roy. We then met with Roy and his office and were happy to go forward. We reviewed and signed our documents with Justin, and he was very thorough and professional. I would highly recommend this firm for anyone wanting a living trust. Awesome experience from the workshop to signing my documents with Justin Kennedy!! This has been a very exciting and great time for me. I want things easy and smooth for my 2 sons when I can no longer make my own decisions! Roy and Justin are a pleasure to do estate planning with! Thank you all!!! Our current and previous experience with Roy and Justin has been “excellent”. There is much value in the way they prepare Living Trusts. We appreciate their follow up to any and all questions/emails and would highly recommend their office to other potential clients. We had our original estate plan done by R. W. Litherland 16 years ago, and returned this year to have it updated. We were very pleased by the professional, organized and friendly service we received. We particularly valued the rapid and informative responses we received to emails as we worked through the details of the update. Highly recommended! Seminars were very informative. Appreciate answering questions and explaining more than once; discount helped to afford cost to set up trust. Very comprehensive. Very impressive estate planning experience. All contacts from seminar, initial meeting, to email correspondence, to final meeting/signing were extremely informative, professional and compassionate. Roy gave an informative and convincing lecture in his seminar. Everything was very thoroughly explained. After meeting with several other attorneys, we both felt that using Roy was a sound choice. Justin also was easy to work with, patiently going over every minute detail. We now feel our estate trust is in great shape! Roy and Justin provided exceptional and highly knowledgeable service during the process of setting up our living trust. We were very impressed by how well organized the whole process was, and how clearly everything was explained. They both made us feel comfortable and confident the whole way through, and we’d highly recommend their services to others! Very satisfied with overall process which was tailored to all of our specific circumstances. Also happy with extra session at no charge to further explain trust options and related documents. Positive experience from start to finish; most informative; thorough; patient; peaceful environment; welcoming; sincere; calm; genuine. From the first seminar attended through the final signing of our trust documents, the process was extremely professional. We are very pleased with the expertise and customer service extended by all in the office. We are fully confident of the value received, and highly recommend the estate planning services of this law office. Comfortable and easy. All our questions answered clearly. We had the feeling that we were protected, that our best interests were being looked after. We appreciate the fact that we can call with any estate planning concerns we have. Roy Litherland and his office have been exceptional at guiding us through the process of obtaining our living trust. All have been thorough, knowledgeable, very pleasant, friendly and accessible. Highly Recommended! Enjoyed Roy’s presentation, it brought us here. Very impressed with the professionalism and feel happy that we can contact the office with any questions at no cost! Grateful for the reminder calls and scheduled dates so we could be prepared. We like the homework sections to keep us on task! The estate planning process was thorough and complete. Justin, Roy and Jodi were able to answer all my questions. I have 2 disabled children and now feel that my estate is in order to ensure their care in my absence/after my death. I would highly recommend this firm! Completing an estate plan is not just a legal experience, it is also an emotional experience for some people. Roy Litherland and all of the personnel in his office offered excellent legal advice and information. They also provided thoughtful and non-judgmental emotional support and offered a structure to be able to complete the estate plan and for me to process emotional feelings and issues. I cannot emphasize enough how much I have appreciated the broad-spectrum service of Roy and his staff. Thank you very much. It is a relief of a burden for me to have completed the estate plan and it offers peace of mind to me. It is a comfort to know my heirs will have an easier process at a difficult time. Seminar was extremely informative: First Class Presentation! Everything explained in simple English. Answered all questions. Exceeded our expectations. Both Roy & Justin are truly experts. Very accommodating. Thanks. Patient, thorough explanation of entire process. So relieved to finally have taken care of Living Trust for the sake of our heirs. GREAT! Outstanding, thorough, explained a complicated subject clearly, gave us peace of mind. Seminar: Very informative. Consultation: Precise & helpful. Signoff: Great & easy to get through. Thank you! Extremely knowledgeable, thorough, and very helpful in the estate planning process. Willing to listen and answer every question. Walked away knowing I/we have the very best legal representation available in the estate planning field. Roy Litherland was very accessible and I was delighted to find someone speaking on a special needs trust. His overall presentation was an eye-opener. I feel much better after making legal arrangements for my son and myself. Justin and the office staff were very helpful. Knowledgeable seminars with pertinent information. Staff is friendly and always willing to answer questions. An overwhelming task (trust/estate plan) made do-able by clear, concise answers to questions and checklists provided. Have and will continue to recommend the Litherland, Kennedy & Associates, APC, Attorneys at Law. Although a personally difficult emotional process, I greatly appreciate the support and care given to me as I progressed through this weighty process. Protecting all aspects of my life’s hard work is extremely important. May my children appreciate how much they are loved. I have really enjoyed working with Roy, Justin and team. Everyone has always gone out of their way to make me comfortable with my decisions on my living trust. I would highly recommend Roy’s services to anyone that I know. Roy presented a wealth of information that helped us understand the estate planning process and make decisions about our own needs. He also answered questions to help make decisions about our parents’ estates. Although we could have chosen a lower-cost option, Roy made us feel secure that we have the right estate plan and support in place when we need it. I started the estate planning process a few years ago but stopped when I got overwhelmed. After attending Roy’s seminar, I met with him and he made the process easy and easy to understand. Justin went through my estate and explained everything. Knowing I can always come back to ask questions was an added bonus. I now feel that I have adequately prepared for not only my future but my daughter’s [future]. Dreaded to make a trust, but Roy’s law office made it easy and very understandable. Just made us feel that we are in good hands. Recommended highly. Thank you. Roy and Justin were great to work with. They put my mind at ease, answered all of my questions and were extremely thorough in creating my Living Trust. I have peace of mind knowing everything is in place for my daughter. I most appreciate the checklist of what I need to do next! Best decision I made was attending a seminar! Information was very complete. Took enough time to make sure we understood all information. Willing to answer all questions. Very patient and informative. Reassuring to know firm is always available to answer questions. Helpful with special needs concerns. A great experience. Every step explained to our satisfaction and on a level we both could understand. We would recommend this firm to everyone. Very thorough – great service. Covered all our questions. They did our parents’ trust and then we came back and had them do ours. We have over the years of our contact with the law firm of Roy W. Litherland always felt we were in the best place we could be and being helped by the very best people with exceptional background and know how. Highly professional, thorough explanations, flexible with last minute changes. Wow! We highly recommend! After many years of self-attempts at creating a Will or Living Trust, I attended a seminar presented by Roy Litherland. Saying to my wife, “You’ve got to hear this!”, I took her to the next seminar, after which we were both sold. Completing this process was a huge relief in taking this off our “kick-the-bucket” list. Thanks! We’re very impressed with Roy and his team. We attended his presentation initially, and it was highly informative. It’s clear that he really knows his business. Every interaction after that – all the way to the final signing – was exceptionally clear and well organized. We know we made the right choice. Peace of mind provided thoughtfully and carefully. Expert guidance through all stages of the process. We’ve been working with Roy and Justin for the last year on our parent’s trust and now our own trust. We’ve been very impressed with the quality of the services and depth of knowledge provided. Lois Tager also worked with us on Medi-Cal planning, application and senior advice. Wonderful resources! Wonderful people! Six months of research, attending 3 seminars and communicating with 4 firms, I finally felt comfortable with choosing Roy Litherland to do our trust. He is very knowledgeable and precise. He makes complex issues understandable to laymen. His seminars and first private consultation are offered without obligation. Attend and you will understand why I would recommend Roy to a friend. Once your trust is drawn up, Roy’s associate attorney Justin Kennedy reviews every page with the client making sure your wishes will be carried out. Fast, effortless process and easy to understand our plan. Roy and Justin were thorough in explaining our estate plan. They discussed areas of estate plans we would not even have considered. Excellent experience. We started with attending Roy’s free seminar. Our meeting with Roy was great – he was thorough, answering all our questions. The strategy for our estate plan was just what we needed. The final documentation was presented by Justin in a thorough and professional manner. Especially appreciate Roy and Justin are always available for follow up questions. Simple, straight-forward, comprehensive and professional. Words that you might not expect to see together when talking about a law office, but they certainly apply here. Roy and his team make the process of setting up a trust as easy as possible. We would gladly recommend him to our friends and family. From the first contact of the informative seminars to the free consultation with Roy that included all of our children, to our decision to update our trust and finalization of the papers with Justin, we felt well informed – all questions answered – excellent service. The office staff was great as well. Very comfortable experience from the seminar to the actual discussion with the attorneys. Everything was explained in detail and a very relaxed manner. As always, excellent service from the Litherland, Kennedy & Associates, APC, Attorneys at Law. Clear answers to questions on trust details are exactly the help we needed! This was a great experience! The staff was very professional and nice. They did a thorough job and are very knowledgeable about living trusts. We felt very comfortable with Roy and Justin and left very satisfied. These guys are good! Thanks again! Very informative. I truly felt they were acting in my and my family’s best interest. I’ve already recommended Roy’s office to a long time friend to take care of their family’s needs. My wife and I feel more comfortable knowing our interest, and those of our family, are protected for the future. The initial seminar was interesting and well-presented. The interview was professional and the office staff very accommodating. The final documents were thoroughly explained and all of my questions were answered. I was happy that I chose this firm. We were very impressed with Roy’s understanding of the complexities of trusts and the ways that we could protect our assets and provide for our heirs. He and Justin took the time to listen to our concerns and created the tools we need to accomplish our goals. We are very satisfied with their service. This is our second time working with Roy and his office staff. All of them have been professional and knowledgeable. I would recommend his office to others. Easy to follow experience. Roy and Justin made difficult concepts simple to understand. The portfolio seems thorough and easy to reference. We have recommended your firm to others and will continue to recommend. My wife and I are extremely pleased with the Litherland, Kennedy & Associates, APC, Attorneys at Law. Roy is very knowledgeable and professional as is Justin Kennedy. Both answered all our questions and made sure we were satisfied and understood the terms of our trust. I highly recommend their office. Roy and his staff were very helpful and patient. Fees were above board and explained ahead of time. Spent much time answering our many questions. Excellent service. Friendly, knowledgeable, helpful attorneys. I now have great peace of mind knowing my loved ones will be taken care of after my death. Very easy. Informative and eye-opening seminar. The whole process was much simpler than I originally thought. I felt Roy’s office were very professional and thorough in explaining the various options. I believe the trust to be very comprehensive. We found the process of creating a living trust very simple and not costly at all. Roy Litherland and his attorneys did a great job for us and we appreciate it! The workshop was very informative. I’m glad I was told about Mr. Litherland! Justin Kennedy was Oh! So patient and very good at explaining and giving information and motivation on completing what needs to be done. It has been a pleasure working with Roy W. Litherland and Associates. Our first interaction was setting up our parents’ trusts. He helped us through both of their passings. Now my brother and I have set up our trusts. It is such a relief to be able to give the gift of a well-planned trust to those loved ones in your life. Roy’s seminar on trusts was my first contact with the office of Roy Litherland. Every single aspect of the legal consultations, plans, documentation process and personal interactions, every detail, was completed in the most skillful and personally satisfying manner to me. I appreciate having worked with Roy, Justin and Jodi. I could not be more pleased and I would recommend working with them to anyone. The service I received was extremely professional, no pressure. Roy helped formulate ideas as to what I should do in creating my trust! Justin and Kathy also made the entire experience a pleasure! Definitely would recommend Litherland law firm to others!! We found our experience with this law firm to be professional, informative, well-organized, and thorough. We felt valued as clients, and comfortable in our relationship with the law firm staff. We appreciate the professionalism and thoroughness of the entire team. It is a great comfort to know that our wishes will be taken care of upon our passing. Several years ago, my daughter introduced me to an elder law webinar in Los Angeles. I am happy to find someone in the San Jose area that could take care of my senior legal needs. Roy’s office offers complete service to the senior citizen. We attended a trust seminar presented by Roy Litherland. We were impressed by his thorough knowledge and especially his ability to explain all details of a trust. We scheduled an appointment and began the process in one week. We feel comfortable and secure in knowing we have taken care of such an important detail that will make our lives and responsibility of our finances better and easier for our children. We have been working with the Litherland, Kennedy & Associates, APC, Attorneys at Law for many years. We have utmost confidence in our dealings with the staff. The professionalism they’ve shown in handling our affairs and concerns gives us great peace of mind. We appreciate the thoughtful and well laid-out content of Roy’s seminar. This approach was consistently followed by Justin, through the creation of our estate plan. The frequent exchange and clarifications gave us additional comfort that our interests were being taken care of. I knew I wanted to create a trust, but always thought it would be too difficult. Roy’s office educated me on the process and “made it simple for me.” At the same time, I am very impressed with the comprehensiveness of my overall estate plan. We first came to Roy based on a family referral. During the seminar and initial consultation, Roy was very informative and accommodating. The process was very easy. Justin spent a lot of time helping us and really made us feel comfortable completing the trust. We originally had this firm write a trust for us in 2000 and we recently updated it. Our experience has been that both Roy and Justin are excellent teachers and excel at explaining complex details in simple terms. Roy’s introductory seminars provide a good overview and are a wonderful starting point. Best of all, we know that they are here for us as we need in the future. Roy and his team provided an excellent estate plan for my mother. I highly recommend that anyone with assets that they would like to protect from Medi-Cal and still provide excellent skilled care for their loved ones, should seek Roy’s service. I heard about this office from someone at a skilled nursing facility who said “any Medi-Cal paperwork done by Lois is always perfect…check out this law firm!” So I did – and have been very satisfied, from my first free consult with Roy regarding Medi-Cal planning through a complete new trust set up. I highly recommend him to all my friends. Seminar very informative. The consultation session with Roy was excellent. Roy addresses all of your questions and concerns. The follow-up with Jodi is great. Finally, the signing session with Justin was detailed and thorough. Thanks to everyone for making this process easy and comfortable. I am extremely pleased with the services provided by the Law Offices of Roy Litherland. I now have a trust that reflects my wishes and in a format that is clear, complete, and that helps me organize all the details. This focus on education is greatly appreciated and I can rest assured that everything is taken care of in a professional manner. Exceptional service! A very good experience, beyond my expectations. It could not have been more complete. Very friendly but professional. Before we attended the seminar, we didn’t really realize how important estate planning was even this early in our lives. Roy and Justin were great about explaining every step in the process and really making us feel comfortable with our estate planning decisions. Roy’s seminar was informative, entertaining and creative! All services by Roy, Justin and staff were efficient and pleasant. I don’t know why we took so long, but am glad we finally completed the estate planning process. What a relief! In a review of the “Trust & Estate” Planning, we attended a seminar. The expertise shown and the national membership of estate planning attorneys swayed us to this law firm. We had all explained to us with patience and expertise. The service was very good. It gives us great pleasure to have worked with Roy’s office in establishing our estate. Roy and Justin had done a great job in explaining everything as this was most complicated. They were professional, treated us with utmost respect, and made a trusting relationship. They are a law firm that really cares about doing the right thing for you. Thank you so much. Explanations were clear, concise, and very organized. We felt we could ask any questions without feeling we were taking up too much time. This office was able to accommodate a scheduling change by bumping us ahead one week – we appreciated this. I highly recommend this office. The seminar was very helpful and it provided us with the reason to dig further. At their office, Roy and his staff explained the complex laws and simplified it for us. They provided us with the attention and courtesies. Overall, their services were very professional, so much so that we are going recommend them to our friends, definitely. Excellent service, comprehensive information, great people, and good coffee. Overall excellent experience – Roy Litherland and Justin Kennedy were both excellent at describing all that we needed to set up our living trust. They were experienced, personable, and easy to understand. All of our questions were answered in a succinct, straightforward manner. Highly professional, very patient. Great overall services. It has been an eye opener. I would highly recommend Roy’s services – it is easy to see Roy has the experience and knowledge to facilitate the best possible estate planning portfolio. We were extremely impressed with the estate planning service provided by the law office of Roy Litherland. The advice, planning, and documentation it provided met or exceeded all our expectations. From the initial seminar through document signing, I was impressed with the thoroughness of the process and the experience and knowledge of the attorneys. We feel that the law office of Roy Litherland did an excellent job for us. Everything was explained clearly and we know we can call if we ever have questions. We are glad that we have our estate planning taken care of now. The task of creating a living trust seemed really daunting and that is why I think we had postponed doing it. We’re pleased to say that the office of Roy W. Litherland made the process easy and clear. The workshop, initial meeting, and explanation of estate planning portfolio were made clear by Roy and his staff. We’re so glad we now have our affairs in order. Roy and his team did an exceptional job in creating our trust. All bases were covered including resolution of potential problem areas. It was also done on a very short time frame as we were moving overseas. Great job – well done – very quickly! Overall experience excellent. Interesting and informative. Much more than we expected. Grateful for the knowledge. It was very educational. Review was very thorough and all questions were answered. Definitely will recommend to friends and relatives. It was a real pleasure in dealing with this law firm. Everyone was cordial, precise, and to the point. My favorite J Would recommend this law firm to anyone. This law office has always been extremely courteous and accommodating to my needs. They have always exceeded my expectations and I highly recommend them! I am very pleased with the professional documentation presented to me. All my questions were answered no matter how long it took. I appreciate the patience it has taken to get it all done and fully understood! Excellent service; work done perfectly, speedy appointment, and offer for review appointment any time at my convenience. I referred my family to this law office. Both the seminar and consultations were very informative, educational, and organized. We are pleased and relieved – we were well taken care of. Very knowledgeable, thorough and patient explaining details of trust. Helped make difficult decisions easier by listening and offering suggestions. We’re completely happy with the Litherland, Kennedy & Associates, APC, Attorneys at Law. Everything was accomplished in two meetings. The estate plan is thoroughly thought out and puts our minds at ease. We enjoyed working with Roy and his team. They are knowledgeable, humorous and professional. After diagnosis of my husband’s heart condition in 2001, we contacted Mr. Litherland’s office. We attended one of his seminars, and he set up our Living Trust. In fact, I recommended him to my parents for their estate. Some things changed in the last 10 years, so we’ve updated our documents. Peace of mind – priceless. Very thorough. Roy and staff have been providing these services for a while and it shows in their work; professional and knowledgeable. We realized after attending your seminar that we really needed your services. The process was easy and we are extremely happy with the results. Thank you so very much!! Roy gives very professional seminars. He covers all legal issues in depth. Roy’s office is run in a very friendly, professional manner.